Our office is located in a wooded area with a pond. We have all types of wildlife – groundhogs, lizards, frogs, rabbits, herons – I could go on and on. We also have snakes. We generally don’t mess with them and let them do their thing (we would act differently if we ran across a poisonous one, which we haven’t yet). I stepped outside today while on the phone with a client and noticed the birds were making a racket. After I finished the call, I noticed a baby robin was hopping through the grass. I figured his first flight attempt was unsuccessful and his parents were all upset about it. They continued their behavior around a certain tree, mostly ignoring the baby bird. 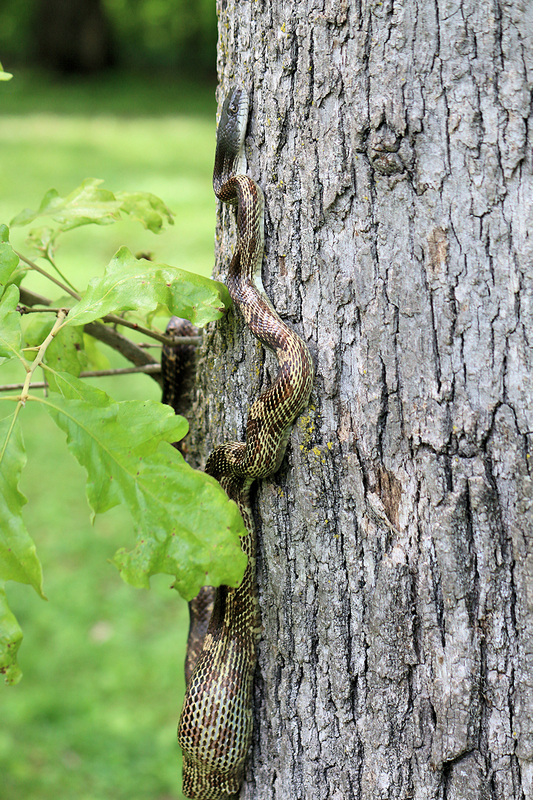 I walked over to the tree and discovered why the robins were freaking out – it was a snake attached to the side. Without witnessing what happened, I can give a fairly good assumption by a couple of clues. 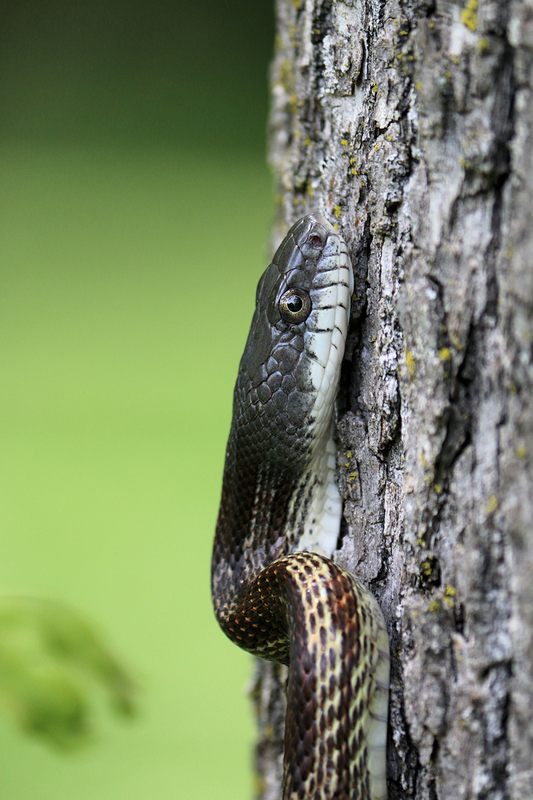 The snake, which was about three feet long and appeared to be a prairie kingsnake, had a gorged belly. It was probably twice as thick as the rest of him. He had just ate something. 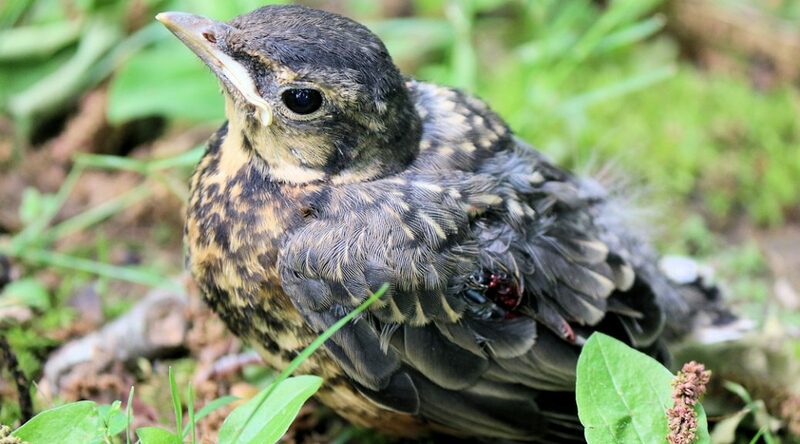 This was the baby robin with the injury on his wing. The next clue was the baby robin in the grass about 20 feet away. I went over to check him out and noticed his wing had blood on it. He could not fly, either he was injured or simply too young. As I approached him, he yelled out and two robins – I assume mom and dad – sprang to action. They panicked even more and tried to dive bomb me, thinking I was going to hurt their baby. I snapped a few photos and took off. 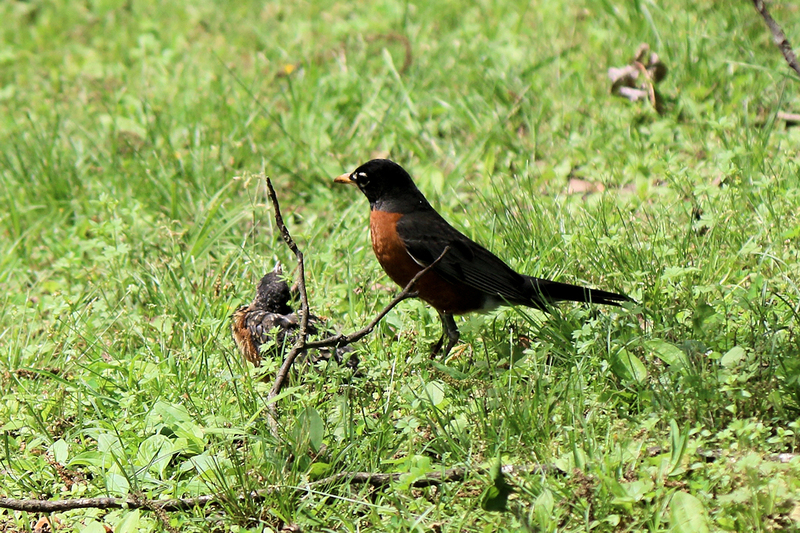 A few minutes later I witnessed mom or dad feeding the baby robin some worms. They were continuing to watch over and protect him as best as they knew how. 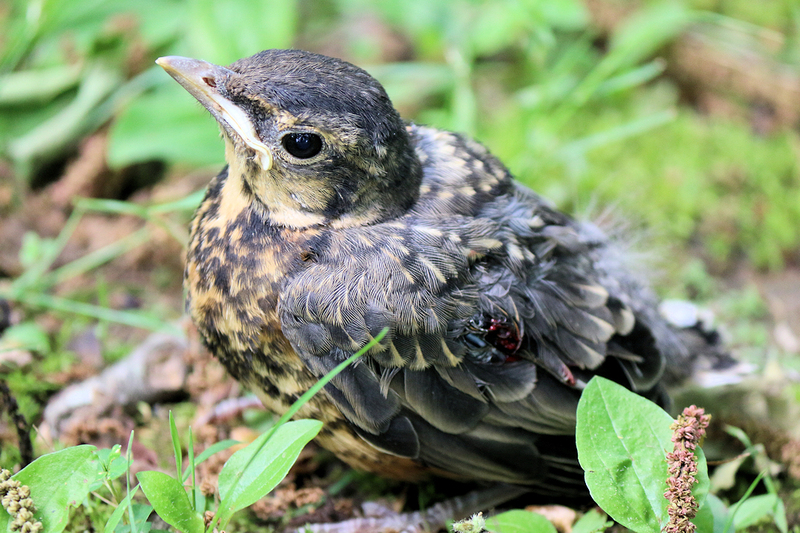 One of the baby robin’s parents were still feeding him while on the ground. I’m guessing the snake raided the robin’s nest and got away with one. One must have escaped and was either bitten or injured when he fell. Nature is filled with beauty and wonder. But it also has a tough side to it, and today I personally got to witness it. 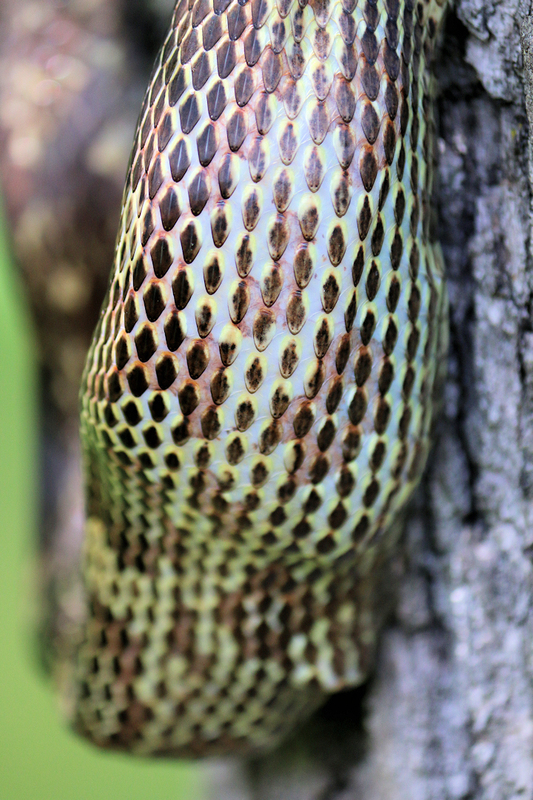 The engorged belly of the snake. 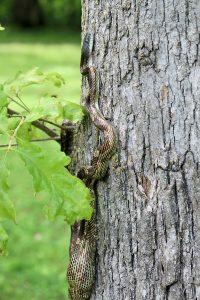 A close-up of the snake. Previous PostOld School Bus in Land Between The LakesNext PostSkink!